How Do I Cancel a Print Job Without Wasting Tons of Paper? You know the drill: You send a document to the printer but nothing happens, so you open the Print Queue. There's the print job, all right, along with some kind of cryptic error message. So you try to cancel or delete the job--and, again, nothing happens. Even after you reboot the PC, the failed print jobs sit there in the queue, taunting you. This head-scratcher dates back as far as I can remember, and even Windows 7 hasn't fully resolved the issue. It's usually the result of a communication problem between the computer and the printer, and the culprit could be anything from a corrupted driver to a faulty USB cable to a wonky network setting (if you're using a network-connected printer). Fortunately, you can send stuck print jobs packing. Download and run the Stalled Printer Repair app, which serves the singular (and singularly awesome) function of purging stuck print jobs from the queue. 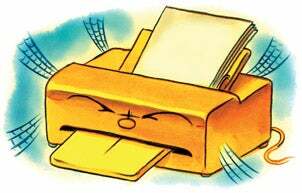 Purging them means those documents will never reach your printer--but after you resolve the issue, you can just send them again.